This is one of those mornings when I feel like there is simply not enough coffee in the world to make me out of this stupor. In part this is my own making. At 4:40 I woke up on my own accord, thanks to my very own bladder alarm going off… and then I decided it was an awesome idea to go back to bed… knowing that I would be awoken by the alarm at 5:30. Had I just gotten on up and proceeded with the day… I likely would be just fine right now. So instead I sit here staring at the screen trying to make thoughts coalesce into word form. Today should be an interesting day for me. When I was younger I was part of my high school gifted and talented program. I feel as though maybe the entrance requirements were a little lax if they were willing to take me. The gifted and talented coordinator, that we lovingly referred to as Jaunamama fought hard to get us some truly unique experiences, many of which I suspect came out of her own pocket. One of these was the Tulsa Town Hall lecture series. Essentially she would take two of us on the long trek to Tulsa to attend one of the lectures in the series, then make a grand day of it all. We would go to lunch someplace nice, and usually finish the afternoon with a tour of the Philbrook or something along those lines. For the last five years, I have worked across the street from the performing arts center without thinking much about it. This year however upon listening to the advertisements on NPR, something clicked and I signed up for the lecture series. Luckily I have a pretty awesome boss and he has filed this down in my PPR as “Personal Development”. A few days ago I complained about the Dark Devices FATE in Northern Thanalan, but to be truthful… once you reach about 45 the zone as a whole tends to be the best place to level. So as a result I have been spending quite a bit of time out there doing the various fates. There are a number of 25k-40k experience boss fates, one of which that drops a pet if you manage to get gold. So as a whole the zone is really worth while even if it did not have everyone’s favorite… Dark Devices. I guess to some extent… I understood why the fate was so popular but I never really understood its full potential until yesterday. Over lunch I was working on leveling my Bard like I have been the last several days, and when I did the ubiquitous “BRD LF FATES” shout in zone, I got invited to be a part of a custom built dark devices group. Essentially the eight man group consisted of 3 White Mages, 3 Black Mages, 1 Bard for mana song, and 1 Paladin for flash. How the group works is a thing of terrifying brilliance… and totally relies on poor game mechanics. Essentially the mission at hand is for the black mages to spam attacks, the paladin to spam flash… and the white mages to cast regen on opposing players. While this does not seem too heinous at face value… it gets there quickly. Apparently one of the ways that healing works is that when regeneration is ticking on a player, it causes aggro to be generated on the pull for the healer that cast it. So far that seems to be working as intended… it has worked that way in most MMO games. Where things go off the rails is the fact that apparently it also TAGS the mob to the healers party. This means by keeping regen up on opposing parties, you can essentially siphon off their kills and give your group credit. This is the king of all “dirty pool” maneuvers, and I do not condone it in the least… however this is so prevalent that if you have a white mage in your party… they are more than likely doing it. When it works… it works insanely well. 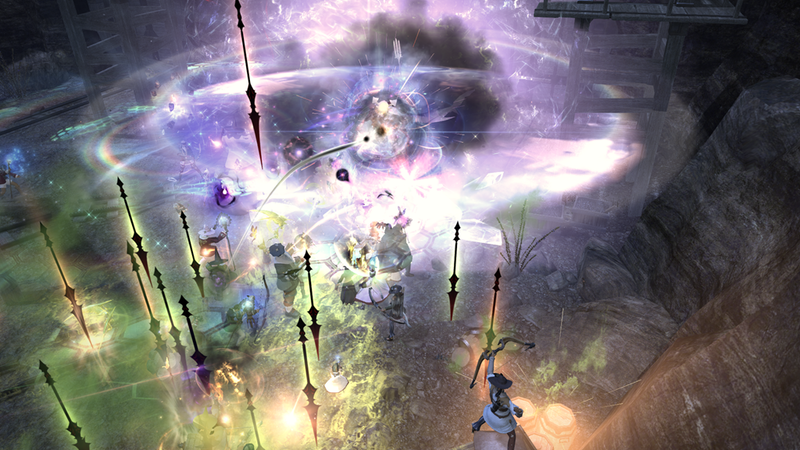 In Final Fantasy XIV there is the ability to chain kill mobs and each additional mob you kill adds a multiplier to the process. I believe you are initially given 60 seconds once the chain begins, and if the counter is low enough, each additional kill resets the counter back to 10 seconds. As a result a big AOE group can get some extremely high chains, but I believe eventually the multiplier caps out around 200%. During the lunchtime group… we managed to get a 354 uninterrupted chain… meaning after the first 20 or so of those… every single mob killed was worth +200% of its face experience value. As a result I made literally over 75% of a level on one single phase of a fate. Dark Devices is a serious gimmick, and still one that I hope they break… because quite frankly it is a bit of an unfair advantage to those players that can get access to a good AOE group. That said… since it is not considered an exploit I am certainly going to benefit from it as much as I can. Yesterday at lunch I was level 45 and after a few more hours out in Northern Thanalan I am over halfway through level 49. Granted I have the insane post 50 xp bonus going on for my bard, but that is some seriously fast leveling. No wonder you see the same people out in the zone every single day farming the fate, over the course of a few weeks you could push almost every single class you had to 50. I did not start out there until around 44, and as a bard you really don’t have all the tools you need to be successful until 46. However I am seeing fresh 40s out there trying to make the fate work for them. The method if nothing else… is brutally efficient. The thing that strikes me the oddest about this entire process is how much it reminds me of the original Everquest. Essentially I have leveled my Bard almost entirely through FATE grinding, and as a result that means sitting in a zone shouting for a group. This is essentially the same sort of thing I can remember doing so many times in the Dreadlands. Throughout the course of the night I would end up in multiple groups that would hunt mobs outside Karnor’s Castle, or various other key farm spots around the zone. If you by miracle ended up with an extremely well balanced group, you might even brave the railroad that was Karnor’s Castle itself. As much as you can solo in FFXIV, you can never beat the type of experience you can get with a party… especially while running FATEs. I think to some extent it is this throwback to an earlier time… this regressive gameplay that has made the game so damned sticky for me. It is like going back and playing Everquest, but taking with me all the bells and whistles and perks of a modern MMO. Essentially the game is almost completely solo-able if you so choose to… but the group content is extremely good when it happens. My huge problem with EQ2 is that while the soloing is amazing, any time you get more than two players together in the same place it feels like a facerolling mess. Granted I have not actually played a lot of the Velious dungeon content, but even the big dungeons like Mistmoore have felt this way to me. 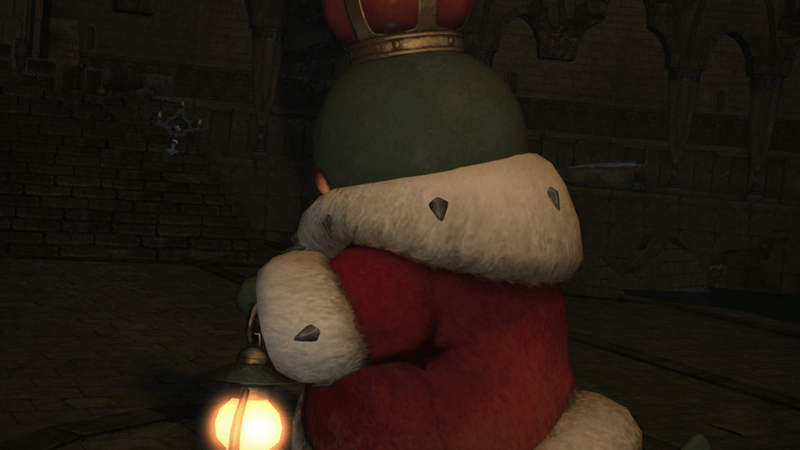 FFXIV does an amazing job with the dungeon content in making it feel like it requires effort and planning to get through it. A few days ago we took a group into Wanderers Palace and had some mixed results. Over the course of the dungeon run we figured out how a lot of the tactics worked, but simply ran out of time before we could formulate a winning strategy for the final encounter. We like to go into these dungeons completely cold, and figure out the boss mechanics on the fly rather than trying to rely on some guide to tell us how to do it. So since we failed to finish the dungeon, there were several of us who had been plotting revenge. Yesterday during the day, over IM we conspired to build a team to take on the challenge that night. Overall I have to say the run went tons smoother, but primarily because we understood how the mechanics worked. We went through the dungeon essentially wipe free and that left us with worlds of time to distill just how to defeat the final encounter. After a few failed tries, we figured out the rhythm of the fight and managed to find a way to juggle the constant stream of adds, and the insane amount of damage the Tonberry King deals from his Grudge attack… that scales based on the number of adds you kill. As a whole the entire encounter felt like a giant tug-of-war match, trying to keep me alive as the tank, but keep the adds off the healer. I didn’t get much from the dungeon other than the experience of running it, but I believe both our Bard and Dragoon walked away with some really nice upgrades. From the second boss a really nice chest piece dropped… but it was statistically identical to the one I received from my level 50 class quest. So I passed and let someone else pick it up as a greed item… though honestly if it is the same stat wise, it won’t be of much use to anyone. This is not the type of dungeon I want to run more than once a night, because it takes a lot out of you… however I enjoyed myself. Quite honestly there are not ANY dungeons that I really want to chain run, because even with the smoothest group these dungeons require more of you than previous games. Well it is that time again and I need to finish this up. I have not really posted much for the Newbie Blogger Initiative this week, but I have plans to do so this weekend. During my Saturday and Sunday posting time I have much more time to work through a topic, so I figured I would use both days to post advice articles. There is so much good stuff out there this year, and I need to get on with updating my blogroll to include the rest of the blogs that have signed up during the Class of 2013. I hope you all have a great day and that it continues on into a great weekend.